Want to mine precious gemstones? Prepare yourselves and put your helmets on because you are going to win huge. Yes! Bonanza is one of the interesting casinos that you will ever play. Here in, you need to dig the diamonds, rubies, sapphires and other gems. This would also help you in triggering free spins and expanding multipliers. What’s more? You get to enjoy all this in the comfort of your home by playing Bonanza online! You can dig these precious gems while playing on your desktops and mobile devices. All thanks to the Big Time gaming which made the game mobile friendly. Rest assured, Bonanza is a real paradise if you want to make the most out of the offers and promotions. Wagering amounts are fair and clear; the game is really an engaging casino with a lovely gameplay, regular wins and free spin rounds that result in some of the biggest wins when triggered. You’ll get thrilled with the regular landing of gemstones as the game starts. Big time Gaming has placed reels in front of the mines that is surrounded by miner’s cabin and a beautiful waterfall. The low value symbols are the playing cards. Scatters are symbolized by golden bars and trigger the free spins. It is important to mention here that the free spins are activated only if you land three of them on the reels. Diamonds, red, blue and the green gems represent high value symbols and 9, 10, J, Q, K, are given lower values. Sticks of dynamite make a wild symbol that is used as an explosive, it is a substitute for all the symbols except G, O, L, D scatter icons. It is a part of the winning combinations and creates an explosion while you win and we would highly recommend you to cover your ears once the explosion starts (*laugh*). During the game, 2-7 symbols appear on each reel. Additionally, four charts carrying additional symbols also appear during the game which give you a chance to add them to the winning combinations. As already stated, once you win, the symbols explode. During the gameplay, diamond is the most rewarding symbol. The maximum payout that you can expect from the game is 10,000 times a single bet in a single spin, and you get 117,649 ways to win the game. Diamond, as stated, offers 50 times the bet for six of a kind. And yes, the free spins are generous that multiply your winning chances every time you mine. Every four scatters give you 12 freebies. Additionally, every time gold bar appears rewards you with 5 extra spins. Once the ‘Unlimited Win Multipliers’ gets activated, your chances of winning increases by 1x on every reaction, provided that you create a longer reaction of winning combinations. To re-trigger the ‘Free Spin’ feature later in the game, you need 3-free spin scatters. Free Spin Scatters provides you with 5 spins and four scatters reward you with 10 freebies. Change of symbols with every spin also changes the ways of winning. The carts start rolling from the right and stop on reels 2, 3, 4 and 5 for the addition of an extra symbol, thus giving you a chance of extra payouts. Diamond: 2 for 2x, 5 for 3x, 10 for 4x, 25 for 5x, and 50 for 6x. Red Gem: 1 for 3x, 2 for 4x, 2.5 for 5x, 7.5 for 6x. Green Gem: 0.25 for 3x, 0.5 for 4x, 0.75 for 5x, and 2 for 6x. A Symbol: 0.2 for 3x, 0.4 for 4x, 0.6 for 5x, 1.75 for 6x. K Symbol: 0.2 for 3x, 0.4 for 4x, 0.6 for 5x and 1.75 for 6x. Q Symbol: 0.2 for 3x, 0.25 for 4x, 0.6 for 5x, and 1 for 6x. J Symbol: 0.15 for 3x, 0.25 for 4x, 0.5 for 5x and 1 for 6x. You get a bonus to every reaction played in the game, and the chances of winning are doubled at every free spin. In every winning combination, each symbol disappears and is replaced by another one falling from above, giving you a chance to form more winning combinations. This continues until you encounter no wins further. And yes, to trigger your winning combinations, you have to activate the free spins by landing the four G, O, L, D scatter symbols on the reels. For this to happen, you are provided with 12 freebies initially. The extra scatter gets you 5-extra spins. During each spin, each reaction increases the win multiplier and you’ll be happy to know that there is no upper limit on that multiplier. The game setting is a gold mine that has been cut into the rock, the reels are flanked up by boulders and prospectors hut, it’s a place where you can rest yourself and your feet if you get tired hunting all the day round. The track is backed up by monster symbols like the monster win slots and the planet of apes that make the game more interesting while playing. All that has to be done to play the game is to manage the 6-reel slot using the Megaways Pay-line system. The 6-reels can feature anything between 2-7 symbols so that the ways of winning change every time you spin. The landing of the symbol on the reels triggers the formation of winning combinations. The winning icons blast off and are replaced by a new symbol after you complete each winning spin. These blasts continue to happen till you are left with no more winning combos. As stated, to trigger the free spin round, you have to land 4x scatters on the reels. The exploding reels during the play add a multiplier to the payouts after each explosion by 1x. So, don’t even blink your eyes while playing, collect the GOLD bars in the carts above the reels because 3x of these can adds 5x free spins to your bonus round. 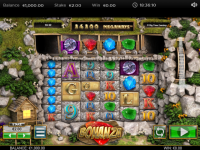 Rest assured, Bonanza would not disappoint you, and it is going to be great fun mining the gemstones. You can win the game through a lot of ways which makes it exciting. Further, the attractive theme, crisp graphics and outstanding soundtrack of the game add to the adventure. Megaways Engine ensures that no two spins are of the same category. It may take time to trigger the free spins but the increasing multipliers greatly enhance your chances of landing a huge cash windfall. As a matter of fact, the game was launched in the year 2016 and is licensed and regulated by Curacao. While playing you can fund your accounts using your credit cards, e-wallets, Beeline, Megafon, and Tele2. However, to withdraw your winnings, you can only use credit cards and e-wallets. The withdrawals are easy and generally take about 24 hours depending on the amount to be withdrawn and the time you placed your request. You can claim your winnings each day/per week/per month. You also get various offers while playing the game which keep on varying and are displayed on the site while playing. The game also offers a welcome bonus that you can claim after making first three deposits. Additionally, you also get 150% match bonus on your first deposit, 100% on second and third deposit respectively. You also get 50 free spins on the third deposit on any of their pre-selected slot machine. The play-through requirement time is 30 days. Besides getting the free spins, you also get an advantage of cash back. This was all about Bonanza. Wait no more and dig you favorite gem out of the mine!